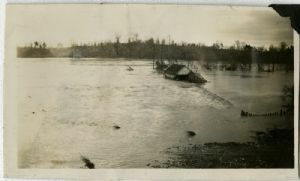 The photograph was in a collection of 1936 flood photographs given to the Western Maryland Room by Nelson Hause's family. Unrau, H. D., & Gray, K. M. (2007). Historic resource study: Chesapeake & Ohio Canal. Hagerstown, Md: U.S. Dept. of Interior, National Park Service, Chesapeake & Ohio Canal National Historical Park.